Description Dermatologist developed, this organically-based wash supports the natural balance of female intimate micro flora to help protect against infections and odor formation. Gentle enough for daily use, this non-irritating formula naturally soothes and moisturizes with botanical bisabolol and aloe vera. 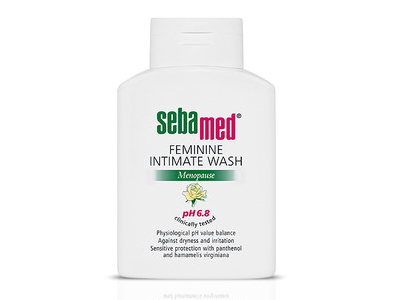 Sebamed skin care The extremely mild, soap-free product line with the same pH as your sensitive skin. Nearly 100% Biodegradable. Cruelty Free. Ingredients Aqua (Water), Lauryl Glucoside, Sodium Laureth Sulfate, Cocamidopropyl Betaine, Aloe Vera (Aloe Barbadensis), Bisabolol, Sodium Lactate, Hydroxypropylcellulose, Fragrance (Parfum), Sorbic Acid. Directions Pour a few drops into hand or wash cloth and cleanse gently. Rinse thoroughly.